Founder Allison Brook was at the awards ceremony, at The Lancaster, London, to collect the award, which this week took pride of place in the window of her Hughenden Yard shop. 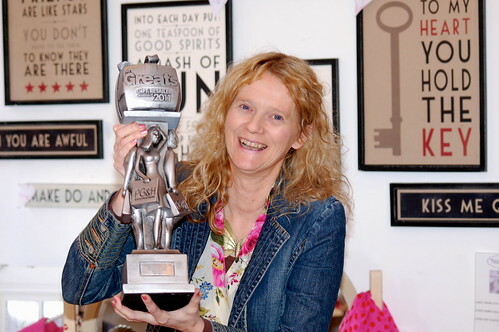 And there was a double reason for celebration after creative merchandiser Tracey Godding – who is responsible for how Tiger Tiger´s eclectic range of stock is displayed – made the top five in the UK Independent Retail Employee of the Year category. Allison´s loyal customers – a mix of local, national and international clients – have been helping staff celebrate all week. “We´ve had cards, calls and flowers; it´s been fantastic. “Retail has been through the mill in the last few years and this award shows we´re doing the right thing. The stock is constantly changing, because we buy limited numbers from mainly small and independent suppliers. We like to buy from designers who are just starting out, so pieces are affordable and you won´t find them in high street stores. Tiger Tiger has two outlets and sells online. The firm started by party selling from a warehouse in Hungerford in 2000. The first retail outlet opened in Newbury in 2002, and the Marlborough branch opened in 2005. In 2006 the Newbury outlet moved to a central High Street location. Greats Awards finalists are nominated by customers and suppliers, and visited by a mystery shopper from Progressive Gifts and Home magazine. Other 2011 winners included Marks & Spencer and Clinton Cards.